The Hair Dryer Bonnet Attachment is a lightweight bonnet that attaches to any hand held dryer. The Attachment is customized specially for all hair types. The bonnet is made with the finest material and has of course, great ventilation too. Made of heat resistant material with build in holes inside the bonnet that circulate heat evenly around the entire area to give you the professional treatment as a salon dryer. Product also includes a drawstring in bonnet to adjust size and make sure bonnet is completely tight and snug. This product is great for drying the braids of installs, great for hot oil and conditioning treatments, roller setting styles and many more! 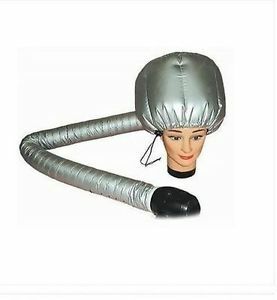 Enjoy the beauty of the salon hair dryer at home with our Hair Dryer Bonnet!